SkyKick is one such reliable cloud backup technologies that can protect data on SharePoint, OneDrive and Office 365 exchange online. It supplements you with unlimited backup on a daily basis for all kinds of business data. It has no data caps, and you can avail unlimited retention for all your emails and files. Set is made extremely easy with no installation. Auto-discovery of SharePoint sites and mailboxes is an added benefit. One click restoration is one of its sought-after features. It saves hours of restoration efforts resulting in productivity and customer satisfaction. 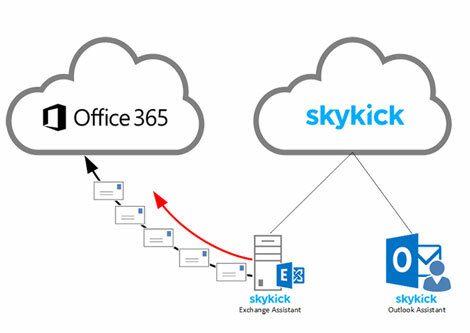 Overall SkyKick is one of the best solutions for all office 365 and Shared point backup concerns. SkyKick allows you to sync all your users’ data before migrating it, allowing for a simple and straightforward transaction. Regular updates and notifications mean you’ll have access to any potential problems and pressure points as soon as they arise- significantly cutting down on disaster management and file recovery time. SkyKick’s Migration Sync technology enables you to migrate as many as 250 user mailboxes at once, so you can have the whole process complete in record time with minimal service disruption. We are just one click away to assist you with SkyKick.